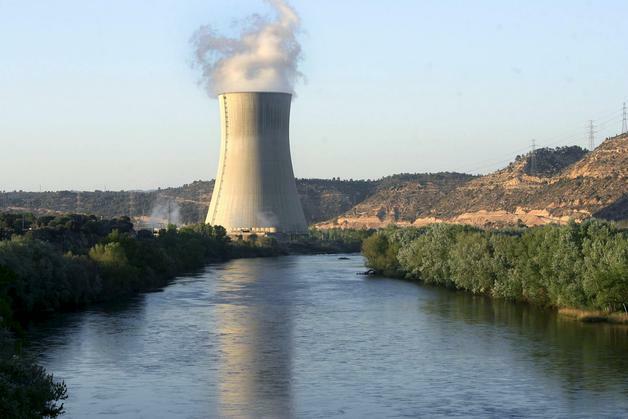 The operation of a nuclear power plant is identical to the operation of a thermoelectric power plant working with fossil fuels like coal, oil or gas, except in the way of providing heat to the water for converting this one into steam. In nuclear reactors this process of producing heat is made by the fission reactions of the fuel atoms. 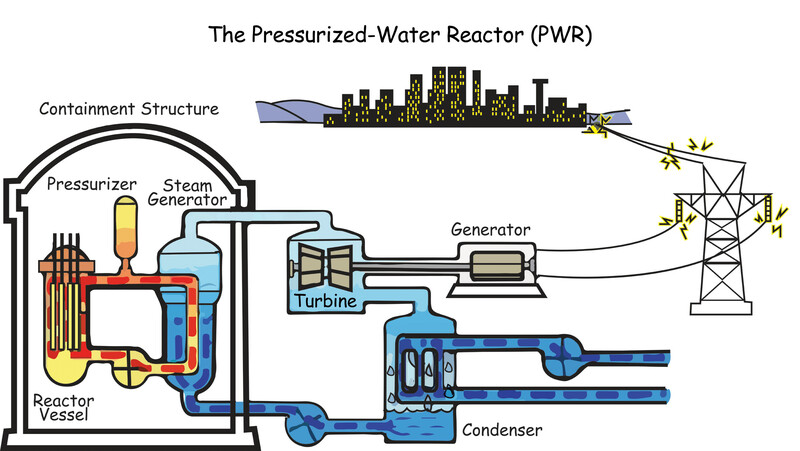 90% of nuclear power reactors in the world, or in other words, reactors for electrical energy production, are light water reactors (in pressurized water or boiling water versions). A variety of types of nuclear reactors are available to operate in a nuclear power plant. However, all types of nuclear reactors have the same goal: to use the heat from nuclear fission reactions to drive the turbines that are going to generate electricity. From all types of nuclear reactors, two stand out: the nuclear pressurized water reactor (PWT) and the boiling water nuclear reactor (BWR). 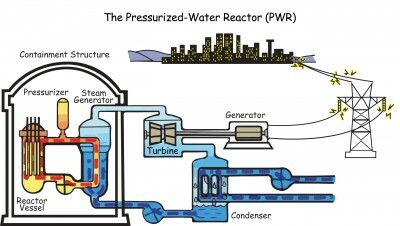 The pressurized water reactor is the most used in the world and the one that we will explain in a simplified way next. Obtaining thermal energy by nuclear fission of the nucleus of atoms of nuclear fuel. Generate steam in the heat generator by means of the thermal energy obtained previously. Operate a set of turbines using the steam obtained. Take advantage of the mechanical energy of the turbines to drive an electric generator. This electric generator will generate electricity. From a physical point of view several changes of energy are observed: initially we have nuclear energy (that keeps the nuclei of the atoms cohesion), later, when it is broken, it becomes thermal energy. Part of the thermal energy is converted into internal energy of water by becoming steam according to the principles of thermodynamics. The internal energy and the heat energy of the water are transformed into kinetic energy when the turbine is actuated. Finally, the generator converts the kinetic energy into electrical energy. The basic principle of the performance of a nuclear power plant is based on obtaining heat energy through the nuclear fission of the atoms´ nucleus from the fuel. This heat energy, already being steam, will be converted into mechanical energy by a turbine, and in the end this mechanical energy will be converted into electrical energy by a generator. The nuclear reactor is responsible for rising and handling this atomic fission that generates a lot of heat. With this heat the reactor converts water to steam at a high temperature and pressure. The steam exits the containment building due to the high pressure that it is subjected to, until it reaches the turbine and the steam makes the turbine rotate. At this moment, part of the heat energy of the steam is being transformed into kinetic energy. This turbine is connected to an electric generator whereby the kinetic energy is transformed into electric energy. On the other hand, the water vapour that has gone out of the turbine, although it has lost calorific energy, it continues being in gas state and very warm. To re-use water contained in the mentioned water steam, it is necessary to refrigerate it before introducing the water back to the circuit. Once out of the turbine, the steam goes to a condensation chamber where it cools down by being in contact with pipelines of cold water. The water steam becomes liquid and using a pump, water is sent back again to the nuclear reactor so that the cycle can start again. That is why nuclear plants are always installed near of an abundant supply of cold water (sea, river, lake) to take this water to the condensation chamber. The column of white smoke that can be seen emerging from some plants is the steam raised when this heat exchanges. A nuclear reactor is an installation capable of initiating, controlling and maintaining nuclear reactions. 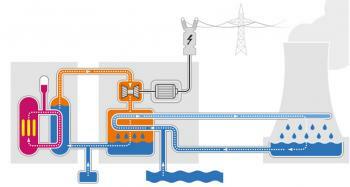 It can have different uses, for example, the production of electricity. The nuclear fuel is the material used for the generation of nuclear energy. The main nuclear fuels are uranium, plutonium, deuterium and tritium.